Newly renovated luxury house with 05 Bedrooms - 04 Bathrooms with two pantry kitchens and roof-top barbecue area. Very residential with high profile neighborhood. A/c in all bedrooms and 02 living rooms with hot water facilities. All rooms fully air conditioned, Solar hot water facilities, CCTV camera with inter-com system, Remote controlled roller doors and two car parks. Ground floor-- One hall with French windows, two bedroom and two bathrooms, dining room and pantry kitchen, Curry kitchen and servant?s toilet. 1st floor-- Three bedrooms with large master bedroom en-suite bathroom and walk-in closet, one common bathroom, hall / TV room with balconies. 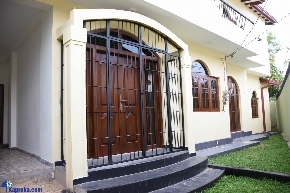 Excellent location with easy access to major road and ideal for locals as well as foreigners. Contact Mrs.Marso on 076-7464169 for further details.